Let’s take a look at one of Honda’s most popular cruisers in the 2017 motorcycle model lineup – the 2017 Shadow Phantom 750 (VT750C2BH). The Shadow Phantom® celebrates the joy of back-to-basics motorcycling by delivering a V-twin ride packing a uniquely clean and uncluttered appearance. By staking out the low-profile approach to cool, the Shadow Phantom reinforces the idea that bling ain’t everything in a bike. If you want people to listen to you, a whisper can be louder than a shout. That’s the idea here: If you want to stand out in a world full of chrome and bright colors, maybe more chrome isn’t the answer. Maybe less is. 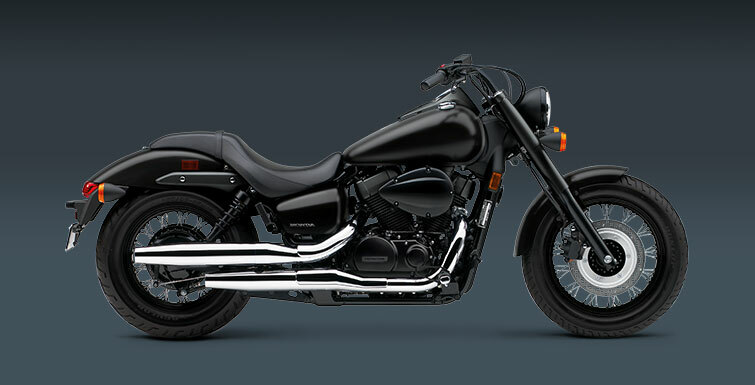 Take one look at the Honda Shadow Phantom and you’re going to know that’s true. The Phantom is for riders who want a great bike, who love to ride and who want to make a powerful statement. Its blacked-out 745cc V-twin engine, black rims, bobbed fenders, spoked wheels and beefy front fork all set it apart from most of the other customs on the road. There’s No Substitute for V-Twin Power – The Shadow Phantom’s 745cc V-twin engine features Programmed Fuel Injection (PGM-FI), ensuring easy cold-weather starting and seamless, all-condition fuel delivery. 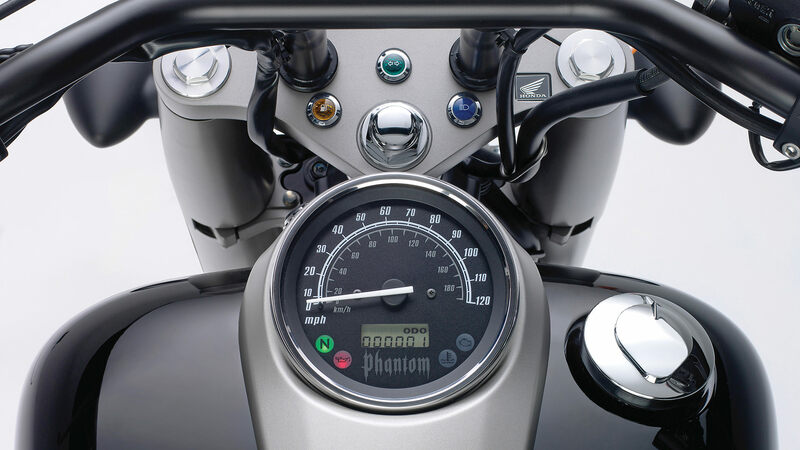 The Phantom Look – Black engine, frame, rims and handlebar—black everything—that’s the Phantom’s trademark look. Engineered for the Long Run – The Phantom’s durable and virtually maintenance-free shaft final drive ensures smooth, dependable power delivery to the asphalt. No hassles, no grease flying everywhere. Just smooth, quiet power transfer. 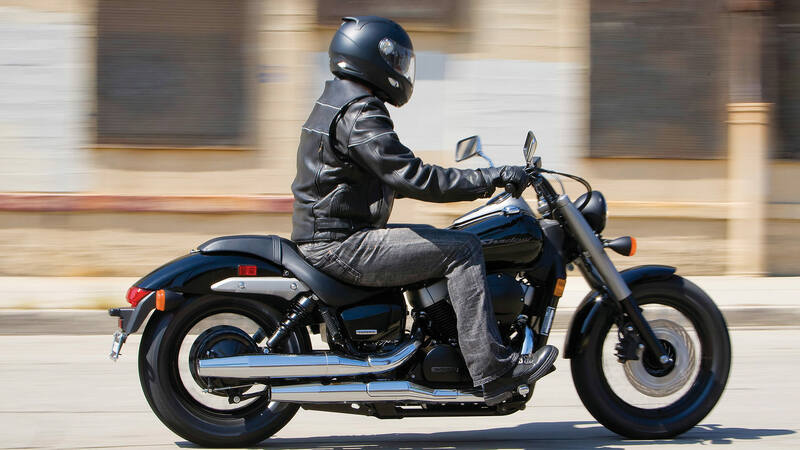 In 2007 Honda launched the popular VT750C2 Shadow. 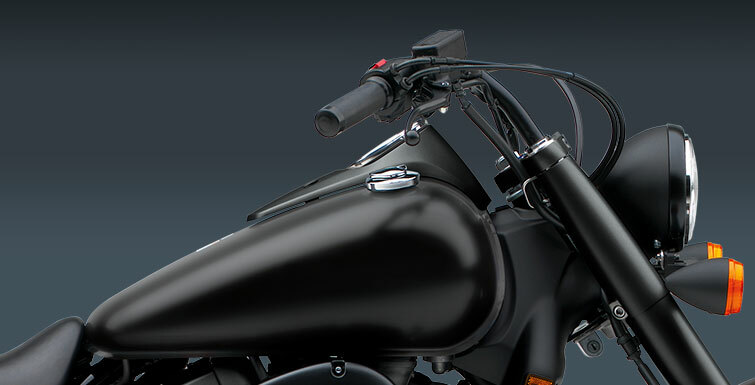 Based on the VT750 Shadow, it took similar design cues from classic cruiser tradition. However, the VT750C2 Shadow Phantom took the concept a step further with more traditional street rod styling, a leaner, meaner profile and a riding position that submerged the rider deep down in the bike for a full experience of the engine’s power. A new PGM-FI fuel injection system intensified the ride while improving fuel efficiency and emissions, and a large 17″ front wheel gave it an unmistakable presence on the street. In 2010 Honda proudly introduced the Phantom, an intense variation on the Shadow Spirit theme with authentic bobber styling and a pure, minimalistic spirit. In one basic color, its bold character made its beefy performance and easy ownership all the more pleasurable. Over the years the Phantom has went unchanged except for the addition of new color options and variations each year. For 2017 the Shadow Phantom returns in Matte Black Metallic similar to what was used back in 2012 but this time around Honda has blacked out a few other miscellaneous pieces too that were originally a bronze’ish color. The Shadow Phantom is based around a low, triangular profile that places the rider in the middle of the ride, and is accentuated with exclusive styling details. Proven technologies ease handling and usability, and deliver a highly involving yet relaxed ride. 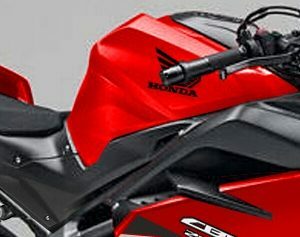 The fuel injection system is tuned for smooth, responsive control, allowing riders to enjoy the engine’s power. The maintenance-free shaft drive and reliable liquid-cooled engine mean stress-free ownership. Riding the Phantom is a stirring experience, and its aggressive attitude and streetwise confidence create their own authority on the street. 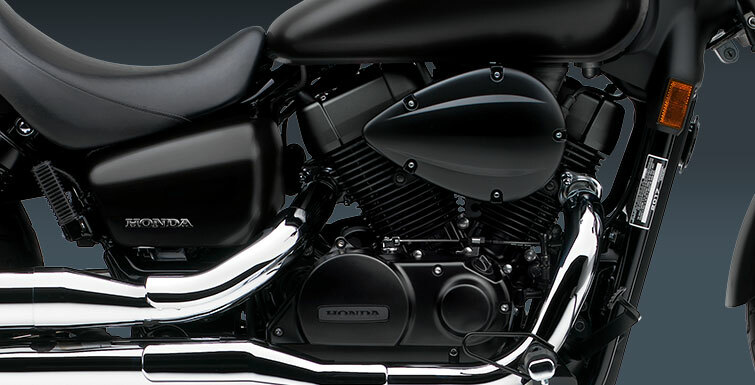 The power at the heart of the VT750C2B Phantom is supplied by the same 750cc liquid-cooled fuel-injected engine used in the VT750C2 Shadow that pumps out 44.6 horsepower and 47.9 lb/ft of torque. Its delivery is tuned for deep, rumbling pulses of power and torque. Accessibility and dependability are also essential to the VT750C2B experience, and the fuel injection system has been developed for quick throttle response and maximum fuel economy that comes in at 56 MPG. 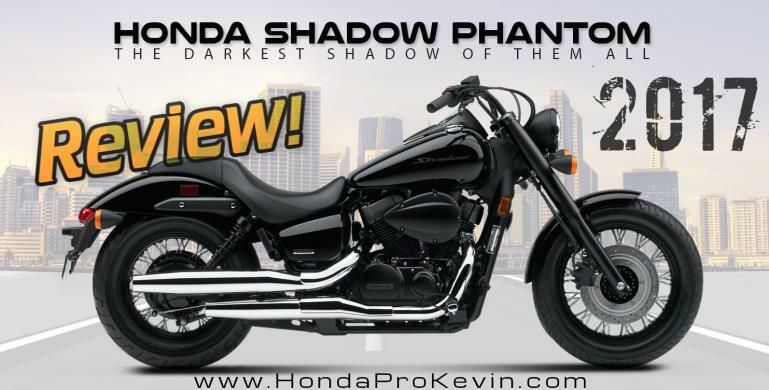 The liquid-cooled 52° V-twin engine powering the Shadow Phantom is a time-proven standard of Honda excellence, essentially the same configuration that provides strong, dependable power to all our 750cc V-twin cruisers. Its compact shape allows the frame’s central backbone to be lowered, facilitating the cruiser’s long-and-low profile. The engine features a long-stroke, single-pin crankshaft configuration and optimal mass to enhance the feel of its low rpm torque peak. Efficient combustion and instant power thrusts are provided by SOHC three-valve cylinder heads with dual spark plugs, while close-ratio transmission delivers strong, exhilarating acceleration from anywhere in the engine’s power range. The sensation of strong, direct power delivery to the rear wheel is down to the machine’s enclosed shaft final drive. Requiring only minimal maintenance, the shaft drive operates smoothly and quietly while enhancing the feel of the engine’s power. The VT750C2B Phantom is equipped with a highly developed Honda PGM-FI fuel injection system, featuring an idle air control valve which precisely controls incoming air for smooth idling operation. The system ensures easy starting, instant throttle response and smooth, satisfying thrusts of acceleration. With accurate fuel flow monitoring, efficiency is also optimized, keeping both emissions and fuel consumption low. The chrome-plated dual shotugun exhaust pipes that accentuate the length of the Phantom chassis are more than just a visual accent on its street rod styling. They also pump out an exhilarating sound that combines with the throbbing feel of the engine to create an exciting ride sensation. Each exhaust pipe is fitted with an oxygen sensor that feeds data to the fuel injection system’s ECU and a HECS3 (Honda Evolutional Catalyzing System) low emissions system. This strictly regulates exhaust gases while still maintaining the engine’s capable performance and thrilling sound. For its design inspiration the Phantom went back to its custom roots. 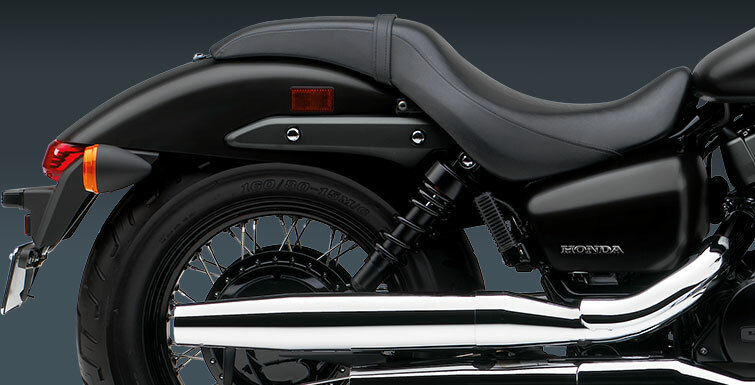 Its clipped rear fender, triangulated profile and thumping engine acknowledge a heritage that reaches back for decades. To true custom bike aficionados, style is important and any lapse in attention to detail is unforgivable. The Shadow Phantom is a perfectly turned-out celebration of an iconic style and culture. 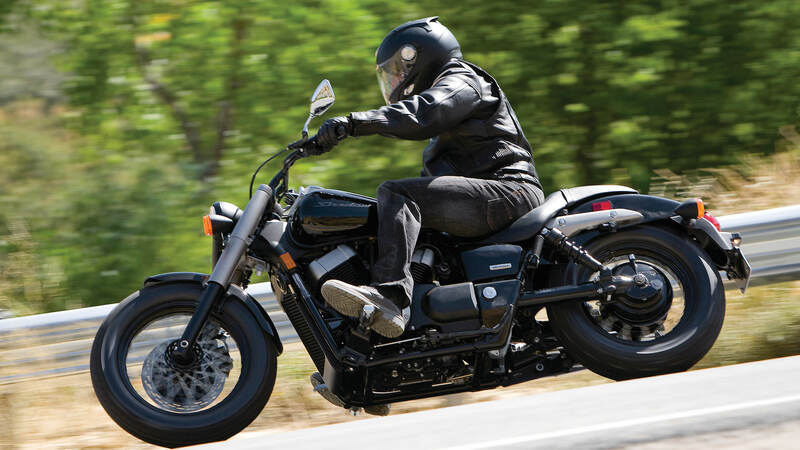 From its bobbed tail to its assertive front wheel, every contour is carefully styled. Its bold, kicked-out forks and raised handlebars provide the point of focus from which it leans back into a long, tapered tank. The instrument panel is placed on top of the tank. 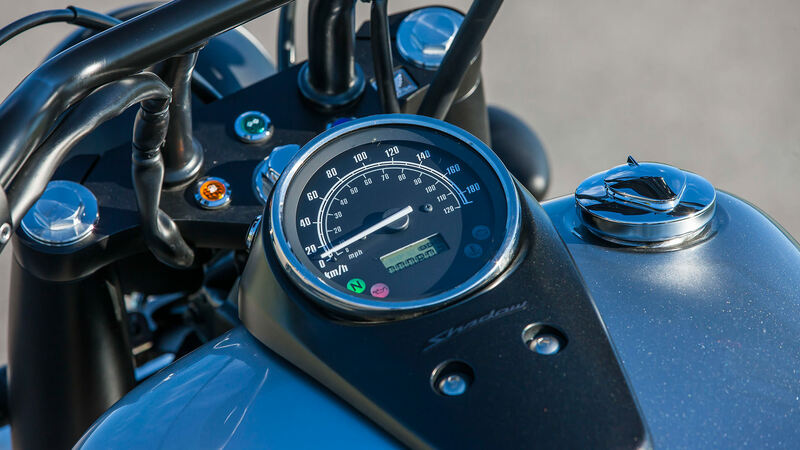 It features a large, easily readable speedometer dial, a compact assembly of practical gauges and indicator lights and an eye-catching silver-painted cover. 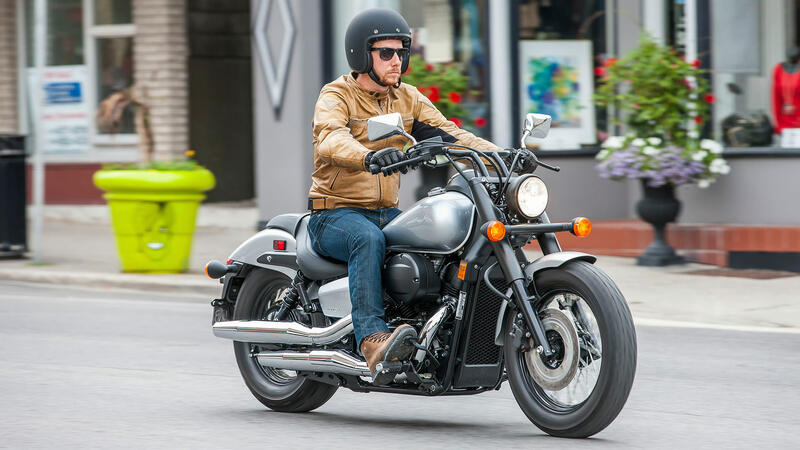 The seat is easily the lowest in the 750cc cruiser class and creates a deep riding position that allows an easy reach to the grips and a laid-back cruiser feel. The engine’s power is contained in a slim, lightweight and rigid double-cradle steel frame that is both responsive and easy to handle. A large-diameter single tube backbone and pressed steel pivot plates combine in a low overall chassis height, allowing for low tank and seat positioning. The seat rails and chopped rear fender are supported by a cast sub-frame. The frame design is an important contributor to the sensational ride quality, transmitting enough primary vibration to maximize enjoyment of the engine’s performance without allowing it to become uncomfortable. The extended 41mm front fork and 17″ front wheel create a remarkably responsive and comfortable package. On the left side, the shaft drive is integrated with the swingarm adding to the clean and simple look. The exposed rear shock absorbers are tilted forward, providing progressive damping and a comfortable ride with precise control. 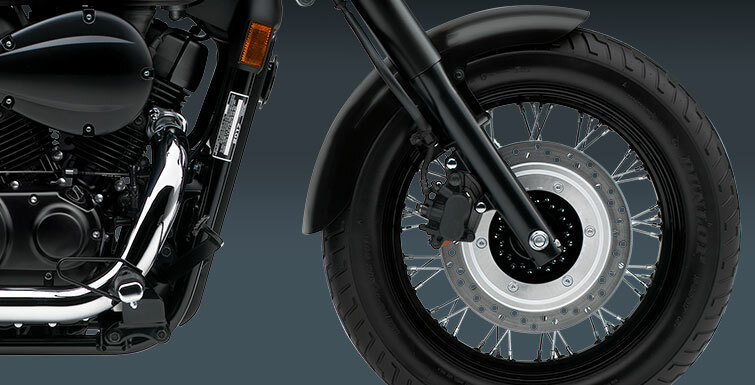 A fat 160mm rear tire emphasizes the sporty custom styling as well as adding to comfort. The powerful brakes perform with smooth efficiency. A large-diameter 296mm front disc with a responsive dual-piston caliper is paired with a conventional 180mm leading/trailing drum brake at the rear. If there’s one place you don’t want retro performance, it’s your brakes. That’s why Honda gave the Shadow Phantom a 296mm front disc clamped by a twin-piston caliper with sintered metal pads for distinctly modern stopping power. Rear brake is drum type. Sturdy and responsive 41mm front fork features large-diameter matte finished shrouds and large billet-aluminum triple-clamp for a distinctive look. Delivers confident, neutral handling. With the Shadow Phantom’s driveshaft you do not have to worry about the added maintenance of a chain or belt-drive. 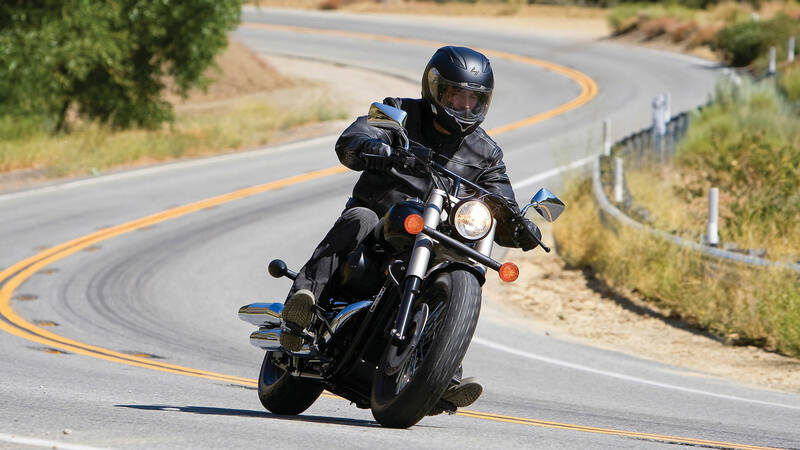 The shaft final-drive system helps provide a smooth and reliable low-maintenance option compared to other chain and belt-drive motorcycles on the market. Ignition coil peak voltage: 100 V min.